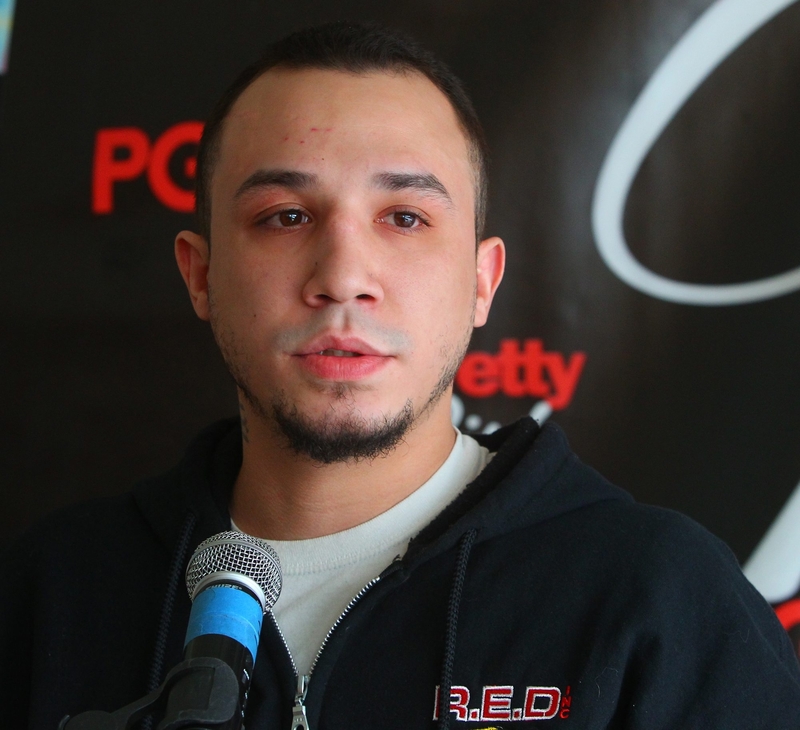 NIAGARA FALLS — Vincent Arroyo made a sacrifice for the good of the show, but it turns out his noble gesture toward a fellow boxer wasn’t enough to get Nick Casal back in the ring to officially start his comeback. The long layoffs for two of Western New York boxing’s biggest names continue. Neither will be a part of tonight’s Fight in the Falls card at the Niagara Falls Conference and Events Center because both of their scheduled opponents failed pre-fight physicals prior to Wednesday’s late afternoon public weigh-in ceremony. Casal’s opponent, welterweight Shakha Moore, was denied a license because he had Lasik eye surgery more than a year ago. While most states wouldn’t deny a license because of that, New York is an exception because licensing standards have become even more strenuous in the Empire State since Russian boxer Magomed Abdusalamov suffered a post-fight stroke after a loss at Madison Square Garden on Nov. 2. Promoter Mercedes Vazquez-Simmons said she learned of Moore’s situation Tuesday. Arroyo, the 26-year-old super welterweight/light middleweight from Amherst, was willing to let his opponent – Marlon Lewis (6-3-1, 3 KOs) of Memphis, Tenn. – move into the main event slot to face Niagara Falls’ Casal, a move that wouldn’t have been too difficult since Lewis was having trouble bulking up for his originally scheduled fight. However, Casal (22-4-1, 17 KOs) learned two hours before the weigh-in that Lewis, who fought three months ago in Dover, Del., also was denied a license because of an issue with his MRI. That means Buffalo cruiserweight Greg Brady (4-1, 4 KOs) moves into the main event slot where he will face unbeaten Joel Shojgreen (8-0, 7 KOs). On Arroyo being willing to step aside to save the main event in the headliner’s hometown: “I would have done the same for him if this was in Buffalo. We’re both businessmen,” Casal said. While Casal had to take a series of medical tests to be cleared to fight prior to signing his fight contract, the boxers from out of state did not. Casal hasn’t fought since stopping Michael Anderson in the third round at Staples Center on Oct. 15, 2011, as part of the Bernard Hopkins pay-per-view undercard. That triumph led to a scheduled fight for the WBO’s intercontinental championship in June 2012 but that bout against Ruslan Provodnikov was canceled due to Casal being attacked by Michael Vicki, who is currently serving five years for the assault with a crowbar. Arroyo (12-1, 7 KOs) has been idle since his September 2011 triumph over Hector Sanchez on Showtime because he got into a legal war with his management team – Richard S. Glaser and Hector Diaz. Arroyo won his court battle in August 2012 but has had difficulty resuming his career. No one is eager to fight him. The future could include a potential fight down the road with Casal, provided either can resume his career. Both are world-class talents that at various points in their careers have caught the eye of Showtime boxing executives. They have fought on major cards, too. Both discussed the topic, with Casal explaining why fighting tonight would not have made boxing sense. “It’s not the right time, it’s not the right venue and it’s not the right money,” Casal said. Simmons said those who bought tickets for tonight will be offered tickets to the next event she plans to hold in the Falls in May. She said Casal and Arroyo will be the headliners on that card, too. “We’d like to make things right and have another show here,” Vazquez-Simmons said. Tickets are available for tonight’s card and prices start as low as $30. They can be purchased at the Niagara Falls Conference and Event Center. Others fights on the card include Buffalo’s Michael Jackson, 26, making his debut against North Tonawanda’s Carl Davis in a super featherweight bout. Eighteen-year-old Jack Ventry of Niagara Falls has a four-rounder against super bantamweight Jesus Gonzalez (1-4). Emmanuel Colon (3-0, 3 KOs) fights Andre Byrd (2-0), Milos Pantelic (6-0-1, 5 KOs) takes on Mike Bissett (5-4, 4 KOs) in a heavyweight bout, and Michelle Cook (0-0-1) battles Ivana Coleman (0-4-0) in other scheduled fights.